My cactus buying spree continues. I bought this one a few weeks ago, without ID. Top and above: Unidentified cactus with huge orange flower. There were three nearly mature buds on this small plant when I bought it, and this was the third and final one to open. Thelocactus lloydii. It also came with two white flowers that have since dried up. A nice large Aglaonema which the seller referred to as A. 'Pink Carmen,' but which looks like A. 'Dona Carmen' to me. Let's see if I can do it. If I lapse, I will of course, do the honorable thing and post about it here. 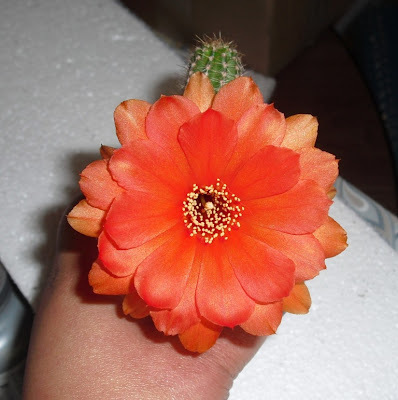 Edited to add 5/24/10: Based on a comment I received, the ID of the above new orange-flowered cactus is something along the lines of a Chamaelobivia/Lobivia/Echinopsis. See comment #8 for more edification/confusion. LOLOL...love your post here. I came to the end of my buying of succulents also when out of space and tired.. I still dream of arranging/rearranging them all the time, but I can only do it 6 months out of the year...it is so hot here in south Florida from May-October. I hope you will come over and see my tire gardens with succulents...and I have a lot in my screenroom...mostly common ones...but you have some real gorgeous ones that typically are not available here. I heard Target was closing their garden centers nationwide...I am sick over it. (Not sure if it is even true, so don't take me at my word on this). THey usually have the best ones around here. I really like you unknown succ (# 5 from the top). I will go now and read more of your blog...have a fun Sunday!!! #1 unid cactus is a Chameolobivia (Lobivia), but I don't know the species. 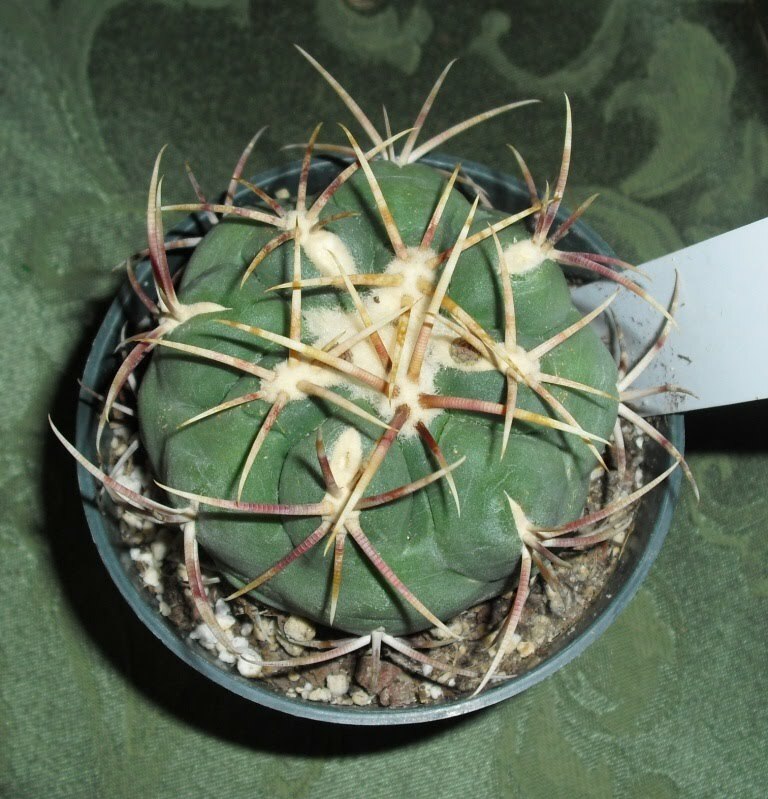 #2 unid is/was a Notocactus/Parodia - it should be mighty purty, as much so perhaps as your Chameolobivia. The G. 'Silver Star' is a pretty plant. Rosemarie (of GW fame) gave me mine, but it's a lot smaller that yours and has some growing to do. Those are great plants - I never figured you as a Thelocactus kind of gal, but what do I know? 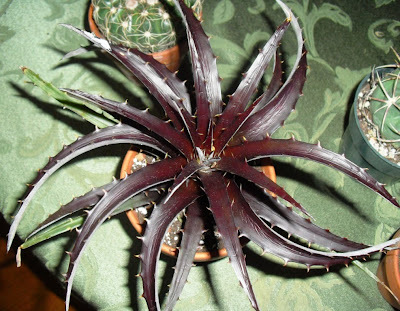 That Notocactus name is slowly, perhaps, coming back to me - I think it may be the wonderfully purple-enflowered N. uebellmannianus (sp? ), the specific also the name of another South American genus. That Herr Uebellmannianus - he got around. If the flower colour is purple (well, one of the shades of the purple spectrum - my colour wheel is sometimes not inflated), it's that cactus. Don't you with that there was also another Pachycormus species? We have had Pachycormus discolor, but I think if there's another one the logical name is P. datcolor. That Dyckia is gorgeous. I love how a tiny little cacti can put out a gigantic flower. The Targets up here have never had garden centers to my knowledge, and stopped carrying indoor plants two or three years ago. Thanks for the IDs; I will update the post accordingly. It's not so much that I'm a Thelocactus kind of girl, as that I am an encourage-the-nursery-that-puts-labels-in-its-cacti kind of girl. Besides it was flowering at the time, which I find hard to resist. I just went off to do a little research before I made any changes. 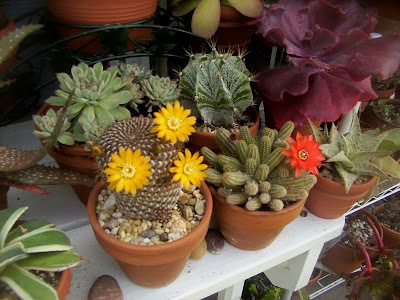 I Google Chamaelobivia, and find some plants that resemble my new orange-flowered plant. Then I find claims that Chamaelobivia are crosses between Lobivia and Chamaecereus. 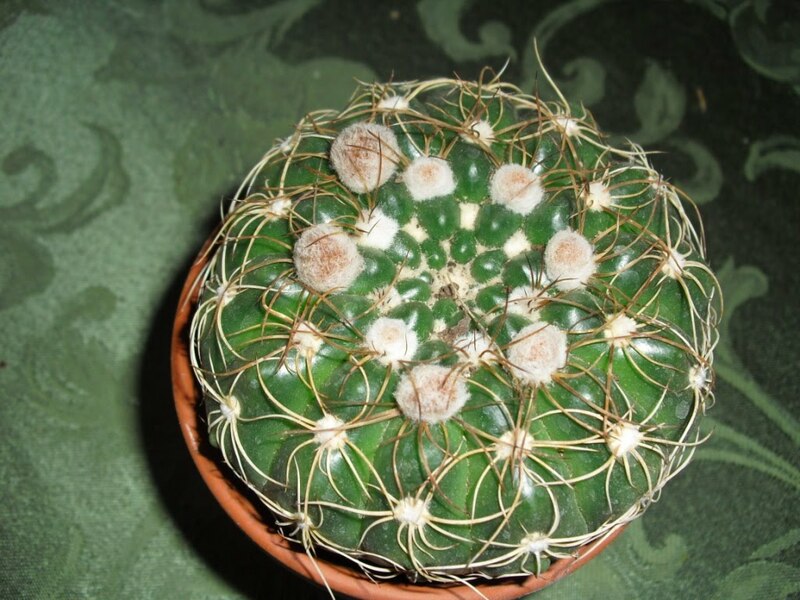 As I mentioned in my post, the old plant that was Chamaecereus silvestrii is now called Echinopsis silvestrii and that, at least according to Cactiguide.com, Lobivia is now also lumped with Echinopsis. Which goes back to my idea that my plant is related to Echinopsis silvestrii. 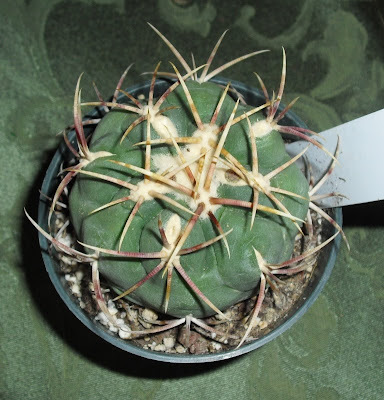 I Google the name Lobivia silvestrii on a lark, and find that it is the same plant as my old Echinopsis silvestrii. ::Exhales::Phew! So I'm feeling I kind of pleased with myself. 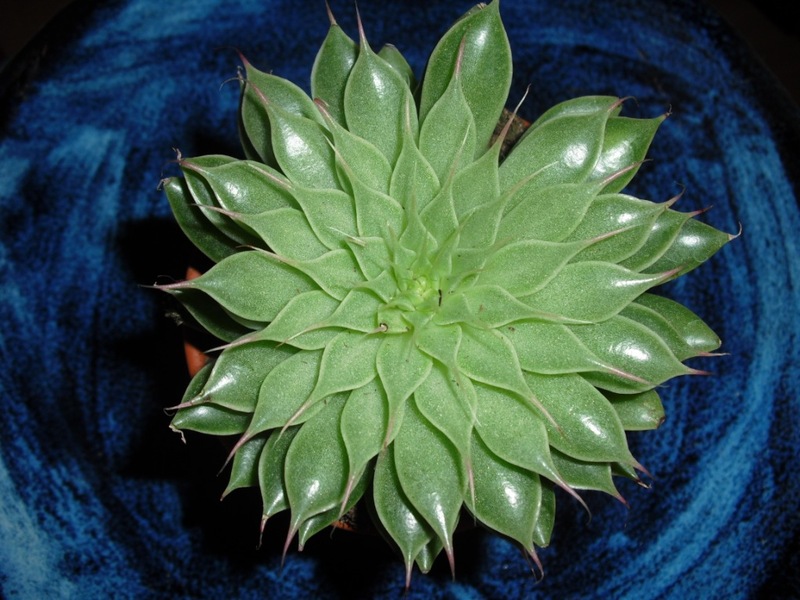 Clearly my new plant, whatever its name, is related to my older plant, and I recognized the resemblance. (They both are even commonly called "Peanut Cactus" Maybe I'm just cactus nearsighted. I'm sure you're now quite familiar with the fact that there's a swirling controversy - is it Lobivia, Echinopsis, Trichocereus or Sohrensia? Be thee a splitter or lumper? Declare yourself, Ma'am. Must I? I have sympathies on both sides. It is clear that as plant science progresses, we are discovering that many plants are more closely related than we might have suspected, and the taxonomy changes accordingly. My head tells me that I must come down on the side of science. My heart likes the old distinctions, and the old names! I guess I'm a reluctant lumper.